Cox offers cable Internet service at speeds ranging from 10 to 100 megabits per second (mbps), and monthly prices from $29.99 to $59.99. The company offers professional installation, security solutions, and other valuable services. CenturyLink offers standard speeds of 20 mbps at $54.99 a month and 40 mbps at 64.99 a month. It also offers speeds as high as 1 gigabit per second (gbps), though this is not available everywhere and prices vary by location. Available in Payson, SuddenLink offers speeds ranging from 50 mbps to 1 gbps. It provides free installation and other support services. Exede offers business Internet in the Phoenix area at speeds of 35 mbps. Cost varies based on the total amount of monthly data usage purchased, ranging from $50 a month for 1 gigabyte to $175 for unlimited. With its fiber-optic infrastructure, Mediacom offers download speeds ranging from 60 mbps to 1 gbps, and upload speeds of 5 mbps to 30 mbps. Monthly prices range from $129.95 to $329.95. Average uptime is 99.9999 percent. HughesNet offers unlimited service from a satellite Internet network, with average download speeds of 25 mbps and upload speeds of 3 mbps. Thanks to our fixed-point infrastructure, Phoenix Internet offers business Internet speeds as high as 100 mbps, with prices starting at $90 a month. Phoenix Internet also has the ability to provide Internet connections in locations that are inaccessible for other providers. 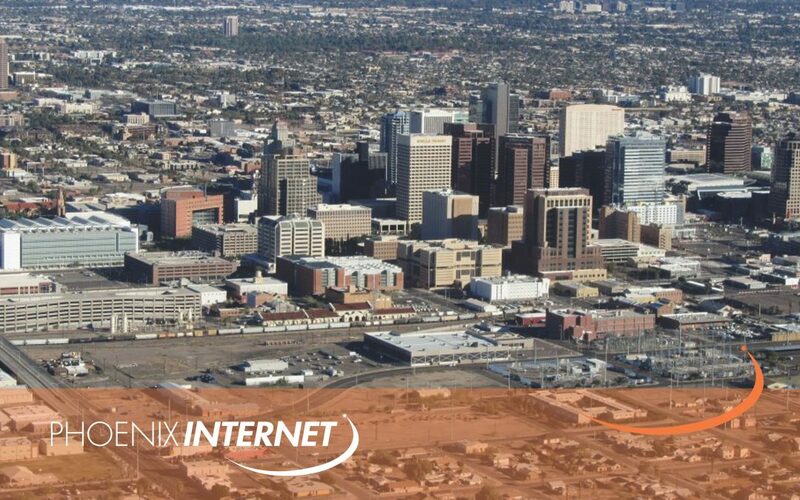 Between their 99.999 percent average uptime, their secondary Internet services, and their support team that is readily available to help you use your services effectively, Phoenix Internet upholds the highest standards of Internet service in Phoenix. This broadband provider offers business Internet at speeds between 50 mbps and 1 gbps, ranging in price from $45.95 to $109.95. This provider offers cable Internet service at speeds ranging from 4 mbps to 15 mbps, and prices from $84.95 to $199.95. Triad offers business Internet at speeds up to 10 gbps. It also offers disaster recovery services, redundancy services, cloud computing, fiber backups, and a host of other supplemental and support solutions. This managed WiFi service offers business Internet ranging in speed from 15 to 100 mbps. Because it relies on tower service, clients must be in line-of-sight of a connected tower. This service offers business speeds ranging from 25 mbps for $79.95 a month to 100 mbps for $145.95 a month. Offering speeds in excess of 100 mbps, WIFIBY has 99.999 percent uptime. It also offers insurance for companies to protect them if anything goes wrong with their Internet connection. While Pointe Wireless does not publish its average speeds, customers have rated it as exceptionally fast. The company also offers customer service 24 hours a day, 7 days a week. The highest speeds are 1 gbps, but these aren’t available everywhere. Service as fast as 100 mbps is usually available at prices upwards of $100 a month. The type of infrastructure your provider uses affects both the speed of service they can offer and their ability to provide it where you are. For more information on the most reliable business Internet services in the Phoenix area, contact Phoenix Internet today.